They say imitation is the sincerest form of flattery, but Square is definitely feeling insulted right now. The well-funded and popular mobile-payments startup has issued a cease and desist letter to UK-based mPowa, a newer mobile payments company that offers a device very similar to Square’s — plugging into a handset or tablet to enable point-of-sale (POS) mobile payments. But the complaint doesn’t have to do with mPowa’s dongle, or the technology behind it: it focuses on a picture of how it’s used. 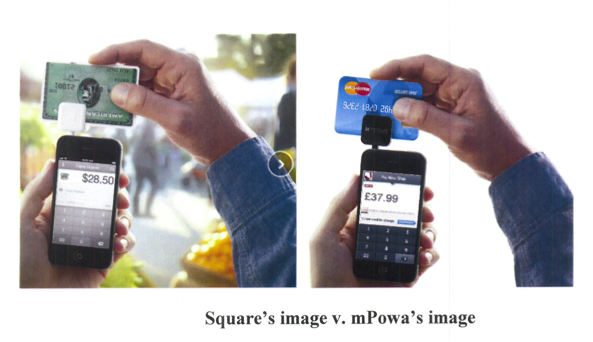 Square alleges that mPowa has lifted a photograph from its site and is using it as its own. And, while mPowa launched in the U.S. the other week, the question of competition is not just in the U.S.: it comes one day after it was reported (yet again, one more time) that Square was planning to go international. He dismisses, too, any implications that mPowa is copying Square in other ways beyond photos. He notes that the company holds several patents on existing technology, specifically around the use of chip-and-pin and identifying users at the device and server end — and is also the holder of patents on technology that it will be introducing down the line, using retina and fingerprint identifications for mobile payments.